Eleven Brilliant ways to cut your Electric Bill in Half without suffering. One of the main things we are trying to do at Current Utilities, Inc. is to save our customers money. Sure, we look for lower electric rates and we are good at that. We work hard to cut your electric bill and save you money. But, reducing your Electric Bill is much better accomplished by Lowering your Electricity Usage. The average home in Texas uses electricity as per the chart below. By lowering your energy usage, you can save 50% or more of your electric bill. Where is your Electricity Going? A lot of people don’t really understand where and how their electricity is being used. And the subject is quite confusing for some. Let’s try and make it simple so that you really can cut your electric bill! 22% of your electricity is being used for heating. 19% is being used for water heating. Between keeping your home at a comfortable temperature and using hot water, a whopping 59% of your electricity is being consumed. The average Texan home is spending $1,800 a year on electricity. If we cut that cost in half, that will save us almost $900 a year. That is a tremendous savings. Your electricity is charged by the Kilowatt Hour. In other words one Kilowatt Hour (KwH or KW/h) of electricity is the use of 1000 watts of electricity being used for one hour. In other words, if you had ten 100 Watt light bulbs turned on for one hour, that would use one Kw/h of Electricity. If you are using 1000 Kw/h of electricity a month, then it is the same as having ten 100 Watt light bulbs on for 1000 hours. Which would be the same as having them on constantly for the equivalent of about 42 days. So, to cut your electric bill in half, one has to reduce the Watts that one is drawing from electric grid every way you can. 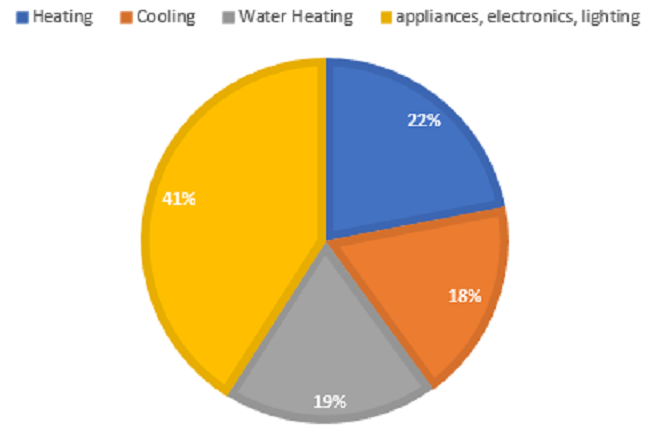 So lets start with the big costs: Heating, Cooling and Water Heating. Let’s Cut your Electric Bill! Hot water use is mainly divided between showers and washing clothes. Simple… stop using hot water to wash your clothes. It is truly not necessary. Modern detergents use enzymes that are far more effective at breaking down dirt than those in the past. The enzymes kick into action at any water temperature above 60 degrees Fahrenheit. So, unless your water is extremely cold, you don’t need hot water. If you have especially dirty clothes, you can use warm water. But in 99% of the cases cold water will be just fine. And your clothes will last longer too! Simple… have a cold shower.. Kidding! Your average household shower head allows 10 gallons of water per minute to pass through it. However, there are shower heads available for a relatively small cost that will cut that down to 2.5 gallons per minute. That is a 75% reduction in water usage and thus a 75% reduction in hot water use. Speak to your home hardware expert and get a shower head that reduced water consumption and watch the savings! Your water bill will like you too! Change your water heater to an on demand heater. Reducing Cooling Costs (Saving on Air Conditioning). The Next big culprit for electric usage is your heating and cooling systems. So this is the area that you should concentrate on next. You may have noticed that your ceiling fan runs in two directions – clockwise and counter-clockwise. Run ceiling fans counterclockwise on medium to high speeds during hot weather only when the room is occupied. The proper use of a fan will make the room feel 10 degrees cooler than it is. When you are not home, turn the fan off, and when you are home turn it back on. By using the fan, you will not have to turn the temperature in your room down so low. In fact, you would be very comfortable at a temperature even as high as 85 degrees. By not cooling your house as much, the savings will be extremely high. If you do not have double-pane windows, consider changing your windows. But if you cannot afford that, here is a no cost way of dramatically decreasing the amount of heat is coming in through your windows. Use 1″ bubble-wrap.Simply cut the bubble-wrap to size to fit in the inside of your window, but make sure it does not touch the edge. Then mist the window with water and apply the bubble-wrap. It should stick there and stay there. You can feel the difference by placing your hand next to the window before you apply the bubble wrap and after. Before the bubble-wrap is applied you will feel the warmth coming in. After, you should not be able to feel any difference from room temperature. Of course, an inefficient air-conditioner is going to cost you more money than an efficient one. Replacing old heating and cooling systems can really reduce your electric bill. Go outside of your house and run your hand around windows and doors. If you feel any cool breeze escaping from your house, fill it with caulking or weather-stripping. Get a humidifier for the winter months. Dry air not only makes your skin dry causing discomfort, but it also means that your heating equipment has to work extra hard. Humid air retains heat a lot more than dry air. Adding a humidifier to your winter heating strategy can cut the amount that your heater has to work by 50%. And that is a BIG savings. Insulate your windows. Having double-pane windows will cut your electric costs dramatically, but if you can’t afford that, here is a cheap solution – bubble-wrap! Get some big-bubble bubble wrap and cut it to size for your windows (the one-inch bubble size). Cut the bubble wrap to fit inside the window on the glass. Don’t let it touch the frame. Use water and mist the glass and then just stick it on there. It stays surprisingly well. You can easily see the difference it makes if you go and feel the heat/cold coming off a window without the bubble-wrap compared to the window with it. In the summer you run your ceiling fan counter-clockwise, but in the winter, you need to run it clockwise. The reason is simple. Heat rises, and in the winter you want to blow the hot air down from the ceiling. Now that we have taken care of the BIG THREE, lets look at what else can be done to reduce costs and cut your electric bill? Switch from the old light bulbs to florescent or LED light bulbs. A 100 Watt standard bulb can be replaced with a 23 – 30 watt florescent light bulb or with a 16 to 20 Watt LED bulb. Replacing your light bulbs will reduce electric consumption from lights by one third to one fifth.Whats the impact? Lets presume that your have 800 watts of light bulbs on in any given evening. Say from 7pm to 11pm. that would be 4X800X30= 96000 watts a month. or 96 Kw/h of your bill is being used lighting your house. Changing to LED can reduce that to 20 Kw/h instead. At 11 cents per Kw/h the savings per month would be $8.36 a month.2. Unplug appliances that draw power even when off. A simple solution is to put a switch in the circuit between the appliance and the wall. This can be done by adding a power bar that has an off switch and plugging these appliances into the power bar instead of directly into the wall. About 5% to 10% of all the electricity you consume in your house comes from those appliances while they are off. So if you are using 1000 Kw/h a month, you can save 50 to 100 Kw/h by turning off those appliances. Or another $6 to $11 dollars a month. Now that you have learned how to cut your electric bill, let us know how much you saved! Remember, Current Utilities, Inc. can save you even more money on your electric bill by finding you the real lowest rates without gimmicks and clever contract clauses. Let us be your broker. We negotiate with Electric Providers to get you the best rates with the most reliable providers! And best of all, it’s totally FREE!